If you loved my last birdie door hanger, I know you are going to just adore my latest creation. 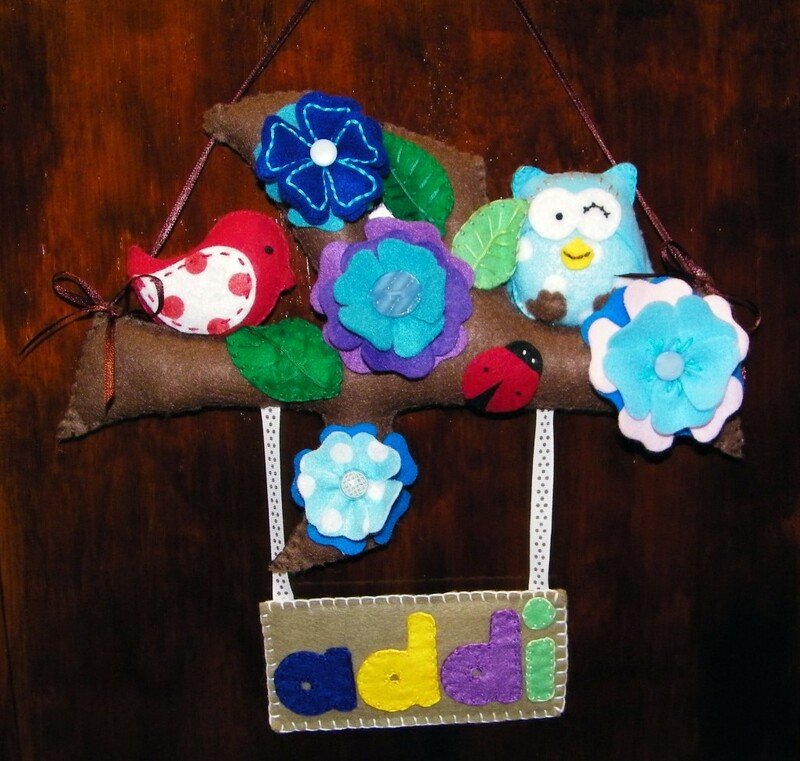 Inspired from the same person as the birdie door hanger, over the last few days I have been working on my own version and replica of a name door hanger including flowers, leaves, birds and owls. I’ve finally finished the hanger and have put it up on the cupboard door in Addison’s bedroom. This is probably one of the most complicated felt creations I have made. I added my own little touches to this project by including Lissylane felt and button flowers, mixing it up with leaves so that it wasn’t too girly. I used both a bird and owl to match in with the bedroom theme, and just love the little lady beetle! Instead of putting his full name like I did for his bedroom door hanger, I have put his little nickname instead. I have also tried to keep the colours more boy friendly and think that I have succeeded. As you can see all the little birds, flowers and leaves are attached to a tree branch, and have been hung using matching brown ribbon. Now, before you ask, yes I do have a pattern that I used to make the bird, owl and branch however I’m yet to scan and put it together as a pdf for download. I will of course get to this soon enough and will endeavour to put up a page on My First Baby where everyone can easily access all of the patterns I’ve used to make all of the arts and crafts you may have seen feature on the blog over the last few months. 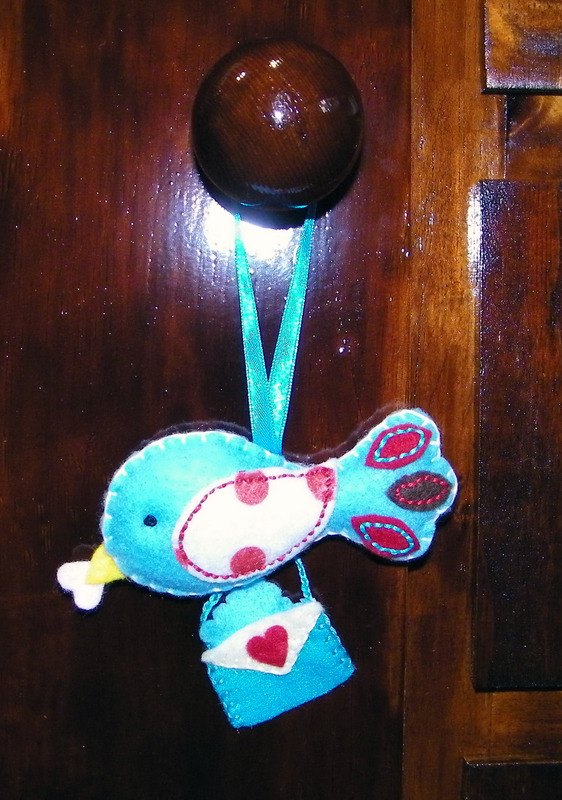 In addition to the door hanger I made a matching little bird to hang on the door knob of the cupboard door. This little blue bird is carrying a love letter and has a cute little heart in his beak. I thought this birdie was perfect to match the door hanger. Once again I will put the pdf pattern for this bird up at the same time as the door hanger. This bird is very similar to the birds made for the bedroom door hanger, just a mini version. I hope you like my latest felt creations, I certainly had a good time making them! Thanks alot this made for very intresting reading. I really love your site, the theme is really cool. I have visited here a number of times but never commented, just wanted to let you know… Keep up the excellent work! Hi, I’ve made the name door hanger, it’s soooo cute. I love it so much. Thanks for the pattern. That’s great!! Would love to see and post a photo of your work. Feel free to email me melissa@lissylane.com So glad you liked the pattern! !